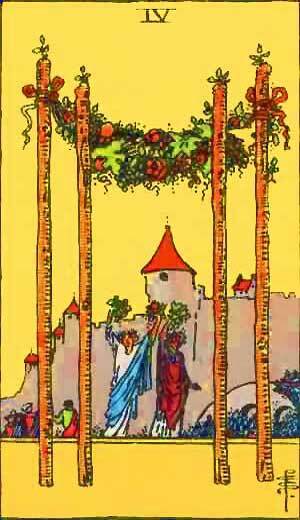 The Four of Wands in a Tarot Reading is a clear sign of success and harmony in love, relationships and your home life being a refuge away from the troubles of the world or other aspects of your life. In the reversed position it basically means the same but perhaps with a warning that these things could be lost. From the four great staves planted in the foreground there is a great garland suspended; two female figures uplift nosegays; at their side is a bridge over a moat, leading to an old manorial house. They are for once almost on the surface–country life, haven of refuge, a species of domestic harvest-home, repose, concord, harmony, prosperity, peace, and the perfected work of these. The meaning remains unaltered; it is prosperity, increase, felicity, beauty, embellishment. A married woman will have beautiful children. Four of Sceptres – Society, Union, Association, Concord, Harmony. Society, association, alliance, multitude and all that implies a gathering of men, even armies; mixture; country life, felicity, augmentation, prosperity, happiness, peace and concord, etc., convocation; advance. It is Air on the Fourth house and the mixing of mercurial and lunar influence will of course explain the idea of gathering. We cannot quite see some of the definitions (contract, pact, treaty), but generally we find the idea of that which binds together by memory and common motives, thoughts, mottos common to a certain group of people, be it family or nation, clan or army. So this leads us to see in the card the expression of the common motive, of that which binds people together. It is not the contract, but the motive which afterwards leads to contracts, or from which the contract will result. A common mistake, in astrological descriptions as well, is this mixing up of definitions relating to the cause and to the effect respectively. Mercury brooding over the house of the family and the moon, engenders homely feelings, memories, thoughts of internal service, household matters, and tends more or less to a profane and familiar or descriptive language, to joke, fun and the theatrical art, to inviting people to come together and have their share in weal and woe. It represents also common sense, which, however, remains in many cases ‘common’ enough. And it contains the motives, which actually govern the facts and actions in this world. The T-cross in the triangle symbolizes measurement and order. The same ideas are related to the number 4, symbol of Beneficence in Qabalah, which also calls 4 the Measuring Intelligence. The square formed by the 4 wands has the same meaning. Third Decanate of Aries, April 10th to 19th, ruled by Jupiter. This Key symbolizes success through personal merit, good social standing, influential friends: the perfection of something built up after labor; benefit through travel, shipping and business with foreign countries. Loss in the same things, or in consequence of unpreparedness or hast action. More information on Four of Wands Tarot card. This entry was posted in Tarot, Runes and Divination and tagged feelings, four of wands, good fortune, harmony, love, marriage and divorce, peace, prosperity, tarot, wands. Bookmark the permalink.